Do you have to apply to Bishop Ward? Yes. All incoming freshmen and transfer students are required to apply to Bishop Ward before they can be admitted. Do you accept non-Catholic students? Bishop Ward accepts students of all faiths. Approximately 10 percent of each class is non-Catholic. Students take a religion class each year where they learn about church history, basic Bible study, Gospel social justice, prayer and spirituality. Do you accept home-schooled students? Bishop Ward accepts home-school students. Parents should contact the Office of Admission for more information. Do you accept Kauffman Scholars? Yes. Bishop Ward currently has more than 30 Kauffman Scholars. Parents should contact the Office of Admission for more information. Students approved by the Admission Boards are qualified to transfer to Bishop Ward. Students may transfer to Bishop Ward through the first week of school or may transfer at second semester. Do you have a shadowing program? Yes. Each catholic grade school in Wyandotte County will experience a shadow day with their classmates at Bishop Ward Students who will not be visiting with their schools are welcome to shadow a student individually. It is recommended that students wear khaki pants and a polo shirt for shadow days. Contact the office of admission to schedule a shadow day. Shadow days must be scheduled at least two days in advance. How much is tuition and do you have financial aid? Visit our "Tuition, Aid & Scholarships" page for the latest tuition rates. 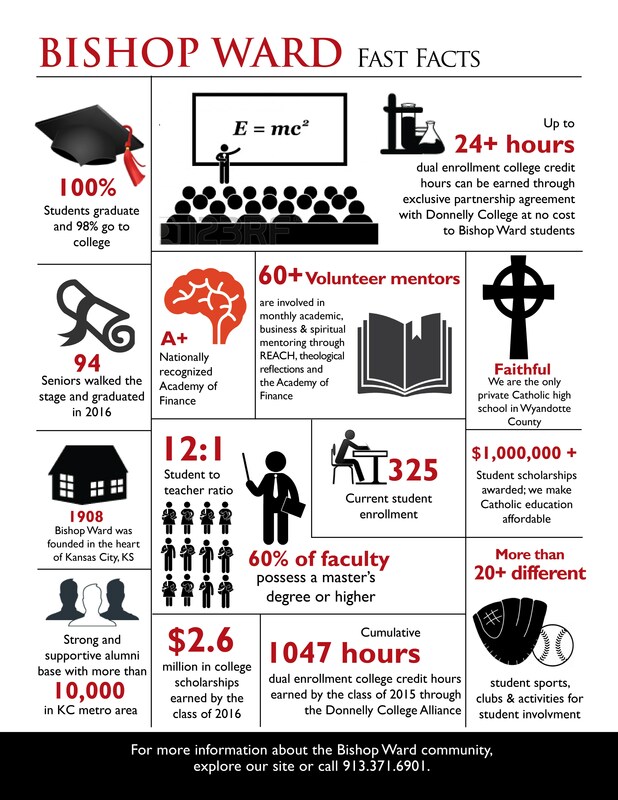 Thanks to the generosity of alumni and other benefactors, Bishop Ward is able to award approximately $800,000 in scholarships and financial aid each year. Are there fees other than tuition? Student Fundraiser - $100 per student or $150 per family. How do students travel to Bishop Ward each day? The majority of students carpool to and from school each day. Bishop Ward coordinates a carpool list that is distributed to families who want to participate. What is a typical class size and what is the student-teacher ratio? Our class sizes range from 5 to 30 students in a class, with a student teacher ratio of 11 to 1. Yes. Both boys and girls are required to wear Bishop Ward High School polos. Boys can wear khaki dress shorts or khaki dress slacks. Girls can wear khaki dress slacks or a uniform skirt. Throughout the year, there are “dress-down” days, where students don’t have to wear their uniforms. The current school uniform provider is Lands' End.